The following was Mark Weinberg's final blog post for us, before his untimely passing. 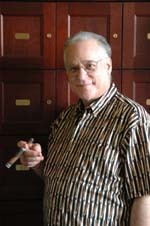 We miss our dear friend, and hope that you will read his thoughts below and consider joining CIGAR RIGHTS OF AMERICA. My name is Mark Weinberg and I have been a customer of Maxis Cigar Lounge for the past six years. On this blog I will be reviewing cigars, cigar toys as well as random related thoughts. I hope you will visit often and find my observations interesting and useful. You can contact me at Mark@Maxiscigarlounge.com with you thoughts and questions. Yes I know it's been a very long time since I posted anything on this blog, but I had an experience this afternoon that has compelled me to take to my keyboard. Since it was about 20 degree's when I left for work this morning I didn't take a cigar with me because I really don't like smoking outside when it so cold. When I went out for lunch it wasn't too bad in the sun so I walked down to 14th street in NYC to a cigar store that opened about two years ago. At that time they promised to have a lounge and so I asked if the lounge was open yet. I was told it wasn't and would not be as the city told them that since they were a NEW establishment that were not permitted to have a lounge. I went into the humidor and picked up a 1964 Padron Anniversario Maduro Principe (yes shocking lol) and went to pay for it. I asked if it was okay to smoke it in the store and they responded by saying it wasn't permitted and I was made to feel it was a problem to even LIGHT UP in the store. Exclusive Members-Only Discounts on Hotels, Rental Cars, Cigar Shops, and More! I urge you to join as this is the ONLY organization that uses all dues to fight for our rights as cigar smokers. Visit their website so that we may continue to smoke in lounges before even that right is taken away from us.